People are always shocked to hear that when I met Tres, I was the pickiest eater on earth. Literally, about the only things I ate were fast food, chicken, steak, pasta, and pizza. I thought I hated seafood and refused to try anything new. When I started dating Tres, that all changed. He encouraged me to try new foods and all of those things I “thought” I didn’t like, became some of my favorite foods. Take seafood for instance, because I had never tried good-quality seafood, I thought it was “fishy” and disgusting. I can say now, seafood is one of my favorite foods, and if I could describe the flavor in any word, it would call it “fresh and clean” which is indeed the opposite of fishy. Even for the experienced seafood eater, ceviche may be alarming because the fish is cooked only by acid, but as someone who used to be picky, all I can say is, you have to try these things or you may never know if you like them. 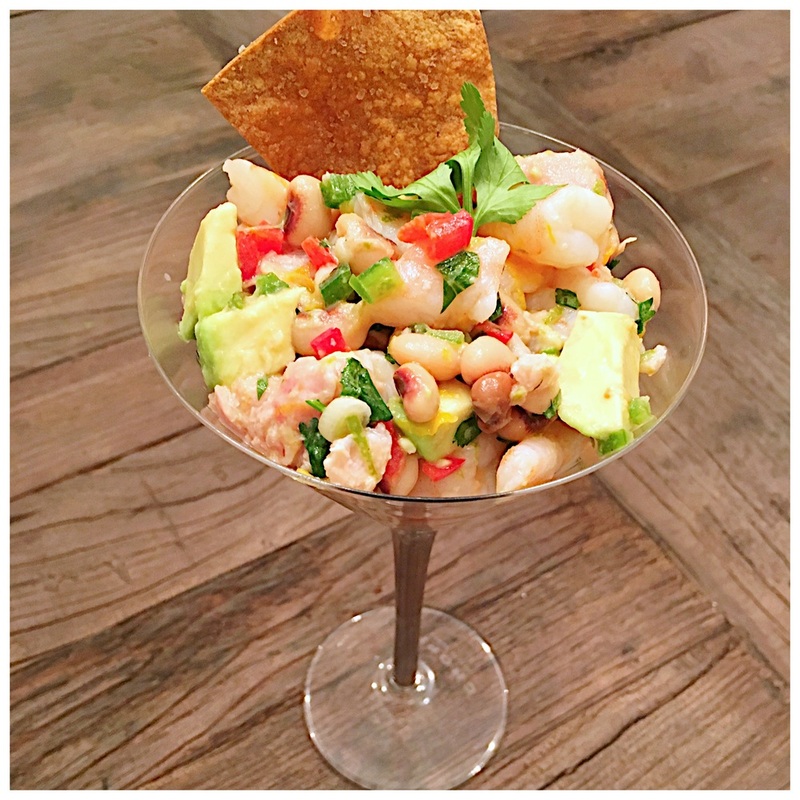 My Southern Ceviche recipe is healthy, fresh, and with each bite, you feel like you’re on a beach somewhere. Heat oven to 375 degrees. Line a baking sheet with foil. Spread tortilla pieces on the baking sheet, brush each side with olive oil, and sprinkle liberally with salt. Bake for about 10-12 minutes, rotating the pan once, until light brown and crispy. Set aside until ready to serve. Bring a medium saucepan halfway filled with water to a simmer. When it starts to bubble, add the calamari slices. Let poach for about one minute then add the shrimp. Let the shrimp poach for about 30 seconds or until they just turn a very light pink. Drain, rinse, and pat the seafood dry. Add the dried calamari and shrimp to a large bowl with the cubed tuna, lime zest and juice, lemon zest and juice, orange zest and juice, black eyed peas, corn, bell pepper, serrano pepper, jalapeno, green onion, cilantro and about 2 tsp of salt. Stir together until all the seafood is coated with the juice. Cover and put in the fridge for at least 3 hours, stirring every hour. When the ceviche is ready, the tuna will be transparent and no longer pink in color. If you desire, stir in cubed avocado. Serve in martini glasses and garnish with homemade tortilla chips.